About a week ago, Mark and I met two Belgian backpackers at Captain Jack’s in Portobelo, during a quiet Happy Hour. We talked a bit and got along pretty well. The following day, after being in the same anchorage for three weeks and getting fed up with the local mentality, we sailed Irie from Portobelo back to Isla Linton. We had three tasks left before we could return to the San Blas islands: do laundry at Panamarina, take on fresh water at Casa X and spend time on the internet to wrap a few things up. Things had changed drastically since three weeks earlier and neither water nor WiFi was available anymore; a bummer, which caused us another tiring and frustrating two-day delay. So, one day, Mark and I took a bus back to Portobelo, to spend a good day at convenient Captain Jack’s again, deal with our internet stuff and take advantage of the organized potluck. The Belgians were still staying there and we hung out a bit more together. By the end of the afternoon, we had invited our new friends to Irie for dinner at Isla Linton the next day and they excitedly accepted a free ride to the San Blas. Veronique is a big dog lover and is on a mission to help all the unfortunate ones she meets. She has been quite successful feeding them dog food, taking some to the vet, giving medicines to others and building protective nests for new born puppies. Olivier is an “old fashioned” photographer taking black and white pictures with film. They became our guests for three days and nights. Together we explored Linton Island, had dinner and set off early for the San Blas islands the following morning. It was their first sailing experience and one dealt better with the challenging sea conditions than the other. The waves were relatively big and the winds strong. 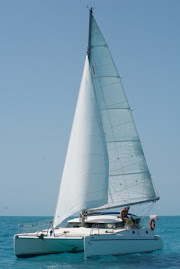 It was a bumpy 45 mile sail, but no weather improvements were eminent over the next few days, so we took the plunge. We had been on the mainland for a month, while we hoped to spend only two weeks running errands and stocking up. The sky was grey and once in a while raindrops kept us chilled, together with the salty waves we banged into. All in all the trip was all right (nothing broke!) and everybody was happy when we finally made the Chichime Cays. At this point, Veronique and Olivier are dropped off at a rustic hut in a small Kuna compound to spend a few days under the palm trees, while we are enjoying some quieter times in our floating home, in the exotic islands. It’s good to be back in paradise for a little while and we are also glad to report that, after weeks of crappy weather, the sun is finally showing her face again! Now, we just have to wait for the vegetable boat to swing by, to replenish our depleting stores. Amazing trail of leaf cutter ants on Isla Linton. Fish! It was VERY heavy in the beginning and then... all of a sudden very light! We did catch another small Spanish Mackerel, with body, later. Mark and I are back in the lovely San Blas islands!